Bombshell Discovery: SoS Goes on Vote Fraud “Witch Hunt,” Actually Catches Witches! Back in 2011, Wade Wagner defeated incumbent North Las Vegas City Councilman Richard Cherchio 1,831 to 1,830. ONE…VOTE! In January, President Donald Trump famously declared that illegal aliens had voted in last November’s election. At the time, Cegavske told reporters that her office had “no evidence” that illegals had voted in Nevada. She didn’t say it didn’t happen. Just that there was “no evidence” to prove it. Still, critics on the right unfairly slammed Cegavske for not backing up Trump even though she couldn’t because, as she clearly stated, at the time there was “no evidence” to do so. Shortly thereafter, however, the SoS’s office announced that two people had been charged with “election-related crimes – one relating to voter registration, and one related to signature gathering for initiative petitions.” Both have since pleaded guilty. But that still didn’t prove that any illegals had actually voted in and potentially skewed any of Nevada’s elections. 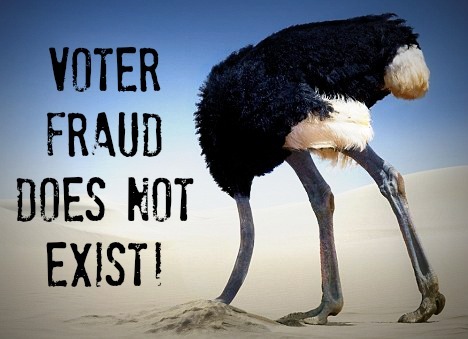 Then came the stunning announcement last Friday afternoon that the Secretary of State’s office had discovered PROOF that illegals did, in fact, vote in last November’s elections. And the Vote Fraud Deniers had a veritable conniption! The DMV denied it was responsible – even though it was – and tried to shift blame back on the SoS, claiming Cegavske had signed off on all voter registration procedures. Which has turned out to be completely untrue. Nevada Gov. Brian Sandoval – who back in 2013 gave illegal aliens “driver authorization cards” – reportedly blew a gasket (in the immortal words of Larry the Cable Guy, he was “madder than Jesse Jackson at the airport having to answer the white courtesy phone!”) at Cegavske’s announcement and immediately rushed to the DMV’s defense. For his part, Clark County Elections Department chief Joe Gloria declared he’d seen no evidence of such illegal voting – but it should be pointed out that one must have one’s eyes open in order to see. And liberal blogger Jon Ralston – a loud-mouthed open-borders opponent of photo ID legislation – immediately shifted into hyper-drive on his Twitter feed to cast doubt on the revelation and minimize the damage by questioning exactly how many people may have been caught voting illegally. Which, of course, brings us back to the Wagner/Cherchio election referenced at the beginning of this column. As that election demonstrates, if even ONE illegal alien votes in our elections, that’s one too many and could very easily corrupt the results of a race. “In March, the Secretary of State’s office obtained from the Department of Motor Vehicles (DMV) a list of just over 100 people statewide who: (1) presented evidence of non-citizenship while obtaining services from the DMV; and (2) completed a voter registration application while at the DMV. Evidence!! The Vote Fraud Deniers can deny no more. And make no mistake; this is just the tip of the iceberg. The other key phrase in yesterday’s announcement was “information obtained to date.” I suspect more examples will be discovered as Cegavske’s investigation moves forward. The federal government maintains numerous lists of illegal aliens who are living illegally in the U.S. – including lists of children of illegal aliens in our public schools and illegal aliens receiving welfare, healthcare and other public assistance. However, many government agencies continue to block secretaries of state from accessing those lists in order to verify whether or not any of those illegal aliens have registered to vote and/or have actually voted in any of our elections. Let’s hope the Trump administration removes these obstructions and obstructionists and gives state election officials the tools they need, and American citizens deserve, to assure the integrity of our elections by making sure no one who is in the country illegally is voting in our elections illegally.